The island of Surtsey was formed by volcanic action off the coast of Iceland in the 1960s. Now, it has been named as one of eight new natural wonders of the world and included in the World Heritage Sites list of the United Nations. Curiously, the island resembles a face in this photograph. 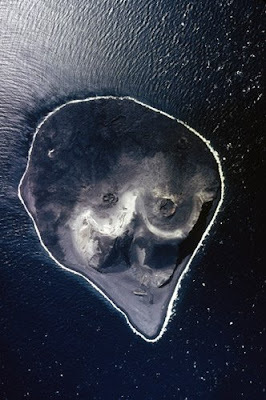 If Surtsey has a face, that must be it! That's a pretty cool image. Hadn't seen that before. Thanks for sharing. I can see the eyes,nose and mustache of this island.